I’ve tried several designs for downspout diverters. Not wanting to spend a bunch of money, I built my own. Here’s the one that works the best. This diverter is made with four elbows and costs little. Cut a piece out of the downspout and insert this assembly. 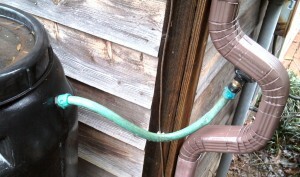 For the water connection, I used a 2 inch PVC pipe cap and threaded a brass male/male garden hose fitting into a drilled hole. After cutting a 1.5 inch hole in the elbow assembly, I glued a piece of window screen on the outside over the hole, then screwed the PVC pipe cap onto the assembly with four sheet metal screws. Some RTV silicone caulk can seal the pipe cap against the metal. Attach a short length of hose to the barrel and you’re done. The advantage of this design is that most of the water is diverted to the barrel, but the debris from the gutters passes by. The screened hole is self cleaning. ← Have you seen Franklin County Fresh Foods?